It's about more than just looking good. 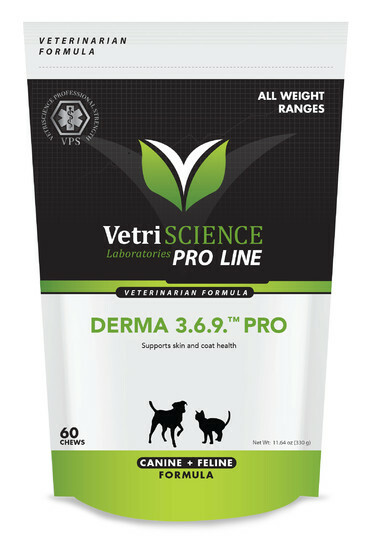 Derma 3.6.9 Pro provides fatty acid support for skin health, as well as for normal recovery after surgery. 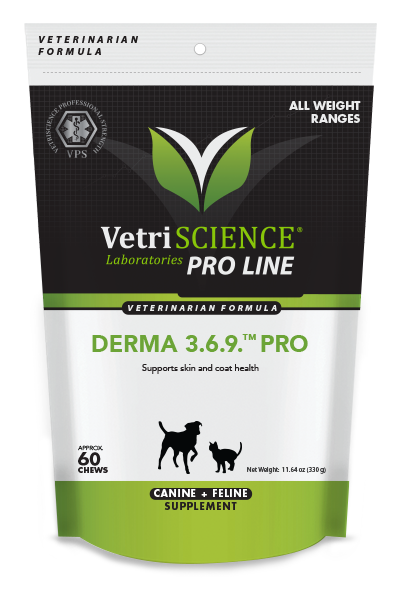 Derma 3.6.9. Pro is rich in essential fatty acids, Omegas 3, 6, and 9, in combination with a special balance of vitamins and amino acids to support skin elasticity, texture, and a shiny coat. It contains biotin, which is necessary for cell growth, the production of fatty acids, and the metabolism of fats and amino acids. This product also contains zinc, which is required for DNA duplication, cell division, and for the production of superoxide dismutase, a powerful skin antioxidant. For cats that are finichy eaters, break or cut chew in half. l-cysteine, maltodextrin, sodium alginate, calcium sulfate, dl-methionine, dried citrus pulp, oat meal, olive oil, safflower oil, vitamin E supplement, zinc citrate, sorbic acid (a preservative), propionic acid (a preservative), mixed tocopherols (a preservative), citric acid (a preservative), rosemary extract, silicon dioxide, vegetable oil, pyridoxine hydrochloride, biotin, vitamin A supplement.